This necklace was found in Middle Kingdom along the Nile River in about 1647. This was usually worn as a necklace or could have been made big enough for a belt or girdle. Many silver and gold pieces in this necklace were made into amulets such as feathers, fish, and leaves. The feathers symbolized all types of birds and showed the liking of them. The fish symbolized all types of fish and showed the liking of them. The leaves were probably most popular, symbolizing wealth. The rocks (beads) are carnelian, feldspar, amethyst, and lapiz lazuli. Lapiz lazuli was the most precious stone, rare for its deep blue majestic color, and was imported from as far away as Afghanistan. The most popular jewelry colors were green and black but often many other colors were used to show different styles, as shown. Wealthy people wore this type of necklace. This necklace is priceless because it is one of the only having silver and gold plus four types of precious rocks. Jewelry there are a lot of different kinds of Egyptian jewelry. There are many different questions to be answered about Egyptian jewelry such as how it is made what is the best quality of jewelry did the Ancient Egyptians make? Ancient Egyptian men and woman regardless of age or social status all wore jewelry Even some animals which were scared to the Egyptians wore jewelry. The Egyptians often wore jewelry. They wore it as a part of their wardrobe. Most Egyptians dug out jewelry from the ground, and it was then crushed into small pieces. People spent days, months, and years trying to actually put together the crushed jewelry. Rich Egyptians wore jewelry wherever they went. There was a very good variety of jewelry. 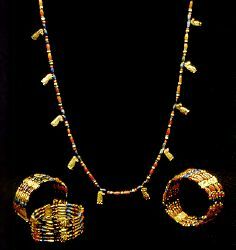 There were necklaces earrings rings, bracelets and even ornaments in use as early as 2500 BC in the Suzerain civilization. Many Egyptians wore jewelry around their waists, like a type of belt. They attached the ends to their navels.They even wore jewelry on their heads and necks They adorned their heads because it resembled a crown and the jewelry worn on their necks was not too revealing. As you can see, there were many different types of jewelry worn on various parts of the bodies of the Egyptian people. People seemed to think that there was a definite quality of jewelry. People have different opinions about the best quality of jewelry, although it was thought the best was either gold or silver, with some people believing it was gold or bronze. However; the best quality was definitely gold. Regardless of all these different beliefs, most jewelry was gold, silver or bronze. Jewelry came from many different places Most of it was made in Egypt. Most of the Jewlery came from Egypt like the bronze and the gold As you can see, there were various places Egyptian jewelry actually originated from. Egyptians believed jewelry was of very great importance The social purpose of jewelry was very important During certain periods laws even regulated its use. The primary purpose of jewelry however; would seem to be to adorn its wearer and enhance his or her glamour. It was socially important for Egyptians to be Adorned with jewelry and this jewelry was a status symbol to them in their society. There are different theories as to which time periods Egyptian jewelry was found. Many people thought it was found in various time periods. Some people thought it was1600-1300BC or 1800-1400 BC or 1000 1900 BC. These are only 3 time periods people believed Egyptian jewelry was found We do not really know the correct answer. The clothing of the Egyptians was quite simple and not very colorful, and this is why jewelry was of importance to the Egyptian people. It added color and decoration to their drab garments. Both rich and poor Egyptians enjoyed jewelry, and it was made of different materials according to what different classes of people were able to, obtain and use to make their jewelry. As mentioned before, gold and semiprecious stones were used to make the most elaborate jewelry. Less costly material such as glass and sand was also used to create jewelry. The Egyptian people decorated almost every part of their bodies with some kind of jewelry as it was very important for them in their culture. Some of the most fascinating jewelry ever found were the ones in King Tut's tomb. To make beads a man would have tongs and a blowpipe forming the rock into balls while men beside him drilled holes into the center of them. Other types of amulets were formed into beards, shells, animals, and lotus flowers. Women wore earrings, bracelets, necklaces, and girdles. Men wore earrings, necklaces, belts, and bracelets. Jewelry in Egypt was always very highly polished by the owners and well taken care of. People of all ages and sizes wore jewelry. To get the jewelry they would make it, buy it at a market, or a wealthy person would pay someone to make it how they wanted.